Learn to live life with greater clarity and vitality. Yoga designed for the brain. For all of us. Help prevent memory loss and maintain a high quality of life. Achieve greater focus and less stress in the workplace. Workshops to eliminate brain fog and improve concentration. Learn simple tools to reduce anxiety, improve focus and stay grounded. For memory-related disease patients & caregivers. Our mission is to help prevent memory-related diseases like Alzheimer’s and those already impacted live a high quality life as long as possible – through tools of yoga. Beyond that we want everyone to live with the utmost vitality and clarity. Who doesn’t experience that “brain fog” that often comes with living busy lives or aging? We tend to think it’s inevitable but in reality it’s not. 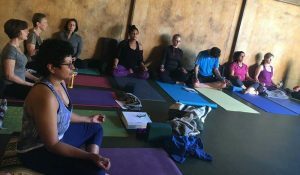 More and more research proves that yoga and meditation help reduce stress (a leading issue for memory loss) and improve mental focus and clarity. 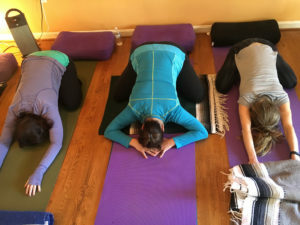 We share these tools of yoga wherever we’re invited – through workshops, private consultations, speaking engagements – and online through social media. 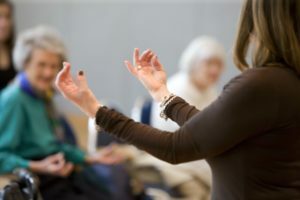 Our workshops can be geared towards senior audiences at senior living communities and senior centers, towards broader audiences through yoga studios and other wellness venues, and at corporations and organizations who wish to help their employees create space for clear and creative thinking.